Control your lights and shades from anywhere – whether you’re home or away. 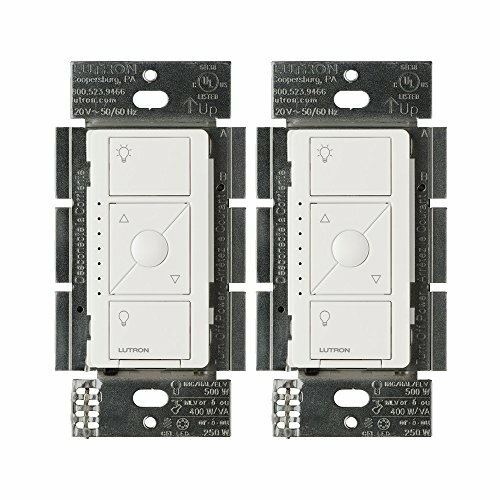 Lutron Caseta Wireless Smart Lighting Dimmer Switch for ELV+ Bulbs installs in minutes and works with numerous bulb types – including dimmable LEDs and CFLs, and MLVs. It's extremely effortless to install the Smart Lighting Dimmer. In 3 steps you can replace an existing switch and install the Dimmer and it can take you as little as 15 minutes (neutral wire required), it is that easy to change your home into a smart home. The Smart Lighting Dimmer Switch allows you to control your lights through different ways. Firstly, you can control your lights through a mobile device via the free Lutron app and a Caseta Smart Bridge or Smart Bridge PRO (sold separately) this comes in handy since you can be anywhere and still have access to the lights at home. You can also choose to control your Dimmer Switch with an Amazon Alexa (sold separately) through voice commands. The Caseta Wireless Dimmer is compatible with ELV+ bulbs which controls many different types. Some examples are the 500-Watt of incandescent, halogen, or electronic low voltage, 400-watt of magnetic low voltage, and 250-Watt of dimmable LED or dimmable CFL (neutral wire connection and 10W minimum load required for all load types). The Smart Lighting Dimmer can control up to 29 bulbs per circuit (based on 8.5W LED bulb, 60W incandescent equivalent) and is tested and recommended for use with over 1,000 bulbs. The Caseta ELV+ dimmer is a great solution for LED fixtures with integrated, built-in drivers, ELV track lights, and problem LEDs that may prefer an ELV dimmer.